Swinford GAA Club will host a Strength & Conditioning/Coaching Seminar on Friday 24th October in the Gateway Hotel from 7pm to 10pm. Liam Moffitt, the physio to the Mayo team will be the main speaker with other keynote speakers. All coaches are asked to attend and any interested players and parents are more then welcome to attend. In the last three months the Club has spent over €7,000.00 on maintenance of the playing surface at Robert McCallion Memorial Park and over €2,000.00 on gym equipment for the upcoming winter training programme. This could not be done without the support of the entire community and the club appreciates all the support. Draw envelopes are available in most business premises and online at SwinfordGAA.ie. 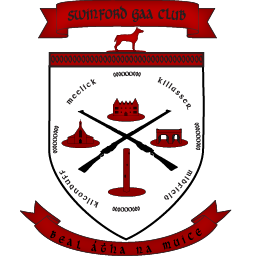 Swinford GAA AGM will be held in the Gateway Hotel on the 30th November at 19:30pm.